An Eye for islands is a Quest in Final Fantasy XV. 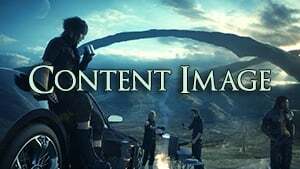 "Noctis accepts another photography assignment from Vyv, who works for a publishing company. Spurred on by the prospect of haveing their picture make the cover of a magazine, Noctis and his friends head to Galdin Quay to get a shot of the Umbral Isle of Angelgard"
After speaking to Vyv, head to Galdin Quay. Take the shot from either location and bring it back to Vyv.